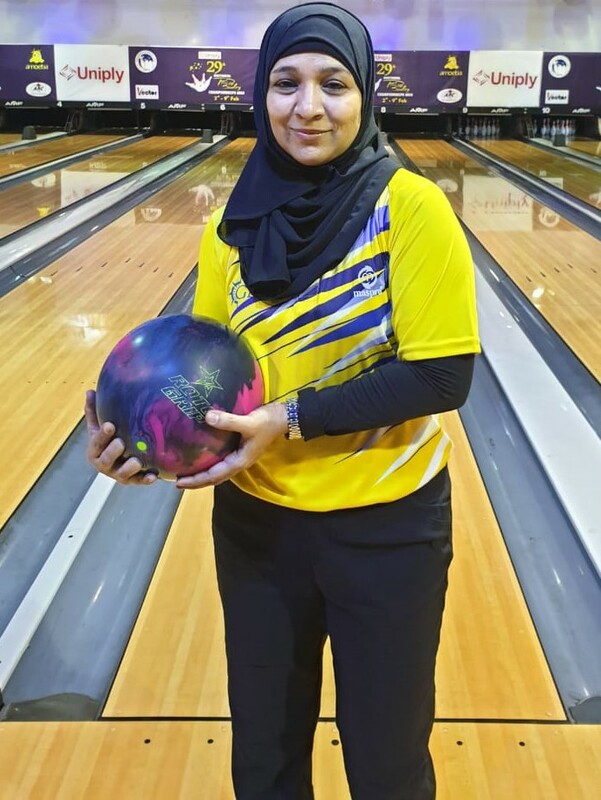 Former National Champion Sabeena Athica of TamilNadu topped the table in the Women’s category, with total pinfall of 1101 on Day 4 of the Uniply 29th National Tenpin Bowling Championships, currently underway at Amoeba, Church Street, Bangalore. Playing her first block of 6 games in Round 1 on Long oil conditions Sabeena Athica (TN) started the day with score of 211 and followed it up with scores of 182, 161, 167, 189 and 191 in the next 5 games and finishing the day with total pinfall of 1101 at an average of 183.50. Preemal Joan Vyas of Karnataka is currently placed second with total pinfall of 1058. Preemal started the day scoring high game of 201 in Game 1 but opened 4 frames in Game 2 scoring only 138. She then picked up momentum scoring 186, 206 and 178 in Game 3, Game 4 and Game 5. She again had a low score of 149 in Game 6 and finishing the day with total pinfall of 1058. Former Champion Sumathi Nallabantu (TEL) is in third position scoring 209, 174, 154, 152, 173 and 149 in her first block of 6 games to finish the day with total pinfall of 1031. Judy Alban of Karnataka is in Fourth position with total pinfall of 1006. In Men’s category, at the end of Round 1, Top 40 Men bowlers, ranked based on total pinfall of 12 games moved to Round 2, which include 13 Bowlers from Karnatka and 11 Bowlers from TamilNadu, 4 Bowlers from Delhi, and 3 each from Andhra Pradesh, Telangana and West Bengal, and 1 each from Madhya Pradesh, Gujarat and Haryana. Akaash Ashok Kumar (KAR) is leading the table with total pinfall of 2564 at an average of 213.67 in 12 games and he is leading over second placed Prathyek Satya (2505) by 59 pins. Defending Champion Shabbir Dhankot (TN) is in third position with total pinfall of 2497. In the Women’s category, all bowlers will bowl 2nd Block of 6 games as part of Round 1, tomorrow morning and in the Men’s category, in Round 2, all 40 bowlers will bowl their 2nd Block of 6 games on Medium oil. Detailed Score Sheets in Attacment. 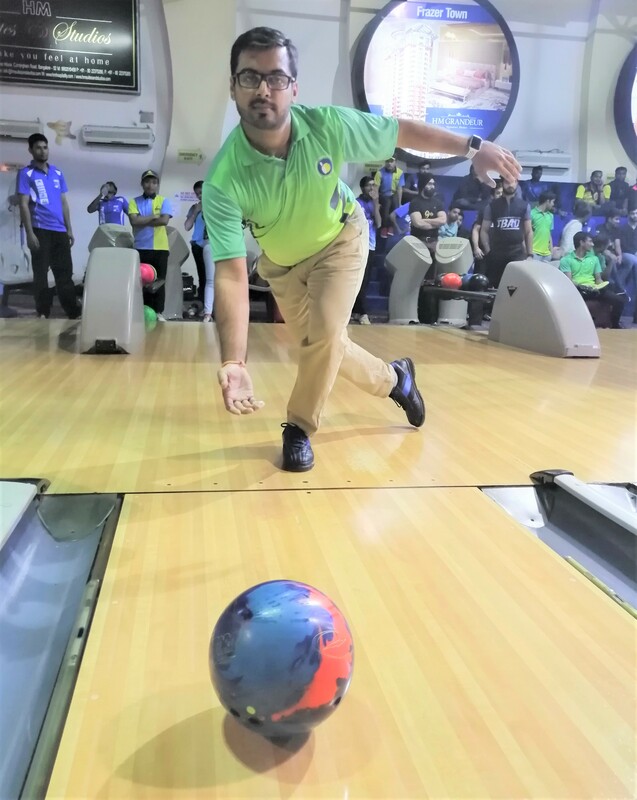 Defending Champion Shabbir Dhankot of TamilNadu was in blistering form scoring 1311 pins and finishing on top of the table in the first block of 6 games in Round 2 of Men’s category of the Uniply 29th National Tenpin Bowling Championships, currently underway at Amoeba, Church Street, Bangalore. Playing his First Block of 6 games in Round 2 on Long oil conditions Shabbir Dhankot (TN) started the day with score of 205 and followed it up with 3 high games scoring 247, 240 and 215 in Game 2, Game 3 and Game 4. He then finished the day with the scores of 193 and 211 in Game 5 and Game 6 and finishing the day with total pinfall of 1311 in 6 games at an average of 218.50. Shabbir is leading the table with total pinfall of 3808 in 18 games at the end of first block of 6 games in Round 2. 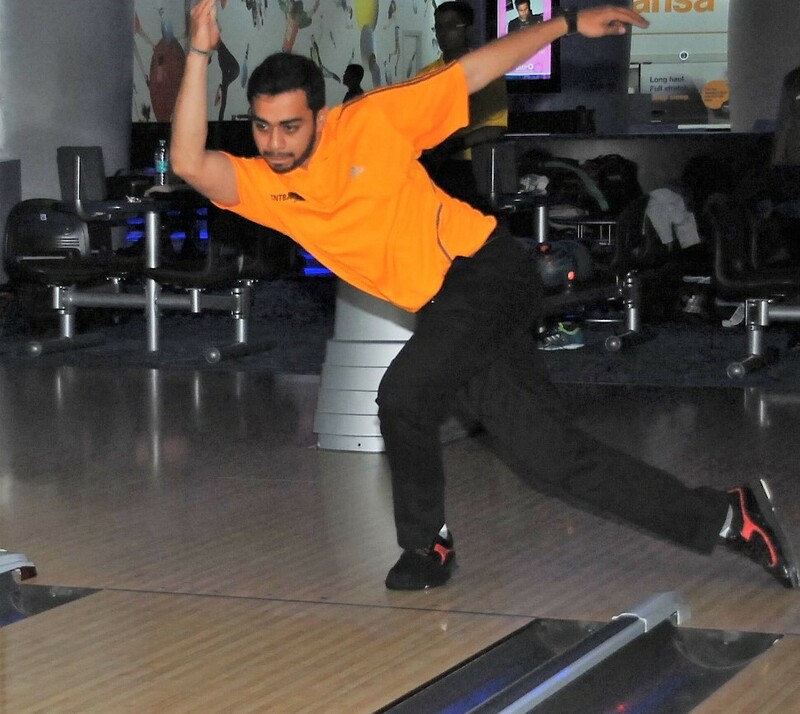 Overnight leader Akaash Ashok Kumar (3751) of Karnataka is in second position and is trailing Shabbir by 57 pins. Prathyek Satya (KAR) is in 3rd position with total pinfall of 3719 and Dhruv Sarda (DEL) is in 4th position with total pinfall of 3678. In the Women’s category, Sabeena Athica (2172) of TamilNadu finished on top of the table after 2nd Block of 6 games in Round 1. Sumathi Nallabantu (2145) of Telangana is in second position and is trailing Sabeena by 27 pins. Judy Alban (2000) of Karnataka and Defending Champion Anukriti Bishnoi (1974) of Haryana are in 3rd and 4th positions respectively. At the end of Round 1, top 8 Women Bowlers made it to Round 2 which includes 3 from Karnataka, 1 each from TamilNadu, Telangana, Haryana, West Bengal and Maharashtra. As part of Round 2, top 8 Women Bowlers will bowl 2 blocks of 4 games each. Top 12 Men Bowlers based on total pinfall of 24 games will move to Round 3 and will play 8 games (4 games on Long oil and 4 games on Medium oil) tomorrow morning. Top 4 Men based on total pinfall of 32 games will move to Final Round, to be played tomorrow afternoon. Top 8 Women Bowlers who moved to Round 2, will play 8 games (4 games on Long oil and 4 games on Medium oil) tomorrow morning. Top 3 Women Bowlers based on total pinfall of 20 games will move to Final Round, to be played tomorrow afternoon. Finals will be played at 2:30 PM tomorrow and Prize distribution function will be held at 3:30 PM.